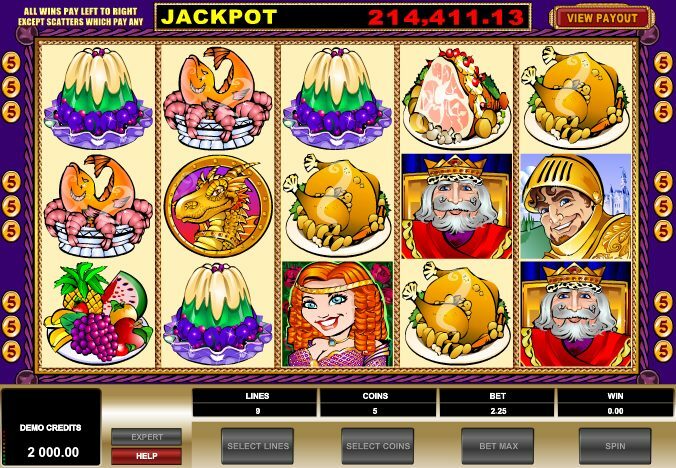 Here’s something a little simpler for fans of medieval slots feasts: online slot developer Microgaming’s historical-themed – well, a sort of history, at least – slot, King Cashalot, sees you gracing the grand banqueting halls of a grand medieval king. 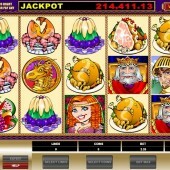 If the luck’s with you, you could be feasting on jackpots galore. A 5 reel, 9 pay-line slot, the game has a fixed coin bet of $0.05, meaning that for low-variance fiends, it could be a game that sees you recording plenty of little wins. Due to this it is certainly a slot that caters for a variety of budgets and will be a slot that both newbies and serious slots players will want to give a try. As well as the king and queen on the reels, gleefully chomping their way through a banquet of roast pig or some other gluttonous meal, there’s a brave knight, a princess, a court jester, a dragon, plus a few of the banquet titbits: chicken, fish, fruit and dessert. The king symbol is the key here: five kings on the 9th pay-line – and the 9th pay-line only – will trigger a progressive jackpot when betting at the maximum amount. The King is Also Wild! The king is also the Wild symbol, substituting for all symbols except the Scatter and Bonus icons. He also multiplies all winning combos he helps form by two. Meanwhile, the Jester icon Scatter pays out for two or more appearances on the reels. If betting the max and going for the chance of a progressive jackpot win isn’t for you, concentrate your efforts on King Cashalot’s bonus round. The Treasure Bonus is activated if you hit two or more gold Dragons on the reels in any position. Essentially a Pick ‘em Bonus, you’ll get a chance to pick from eight treasure chests. You don’t just continue picking until you hit ‘Collect’, though: here there’s a little gamble involved as you’ll have to select whether you want to keep the prize you’ve just picked or gamble and risk losing it altogether. While medieval-themed slots come and go, none offers a progressive jackpot for such a wallet-friendly budget. Free spins may have sent this game into the upper echelons of the ‘must-play’ hit parade, but for its fun and simplicity, as well as some no-nonsense fixed bets, it’s definitely one that could see you cashing a lot. If you enjoy playing this then you should give Microgaming's other medieval-themed slot Avalon a try.